Lately we have been under huge pressure regarding our smoking in general, especially smoking in the house. In a few months time it will be categorically a big NO NO! I guess in summer time it will not be such a big deal, but imagine running outside and standing in the rain every few hours when you want to have a smoke. I was looking at our options and tried to find a solution to this problem. I know that giving up would be the best option but unfortunately this is easier said than done. I read about electronic cigarettes but I did not have a lot of faith in them. So when I was offered the opportunity to try and then review a Smoke Relief Electronic Cigarette I jumped right at it. Firstly let’s answer some basic questions. Ever seen “smoke” machines in nightclubs? 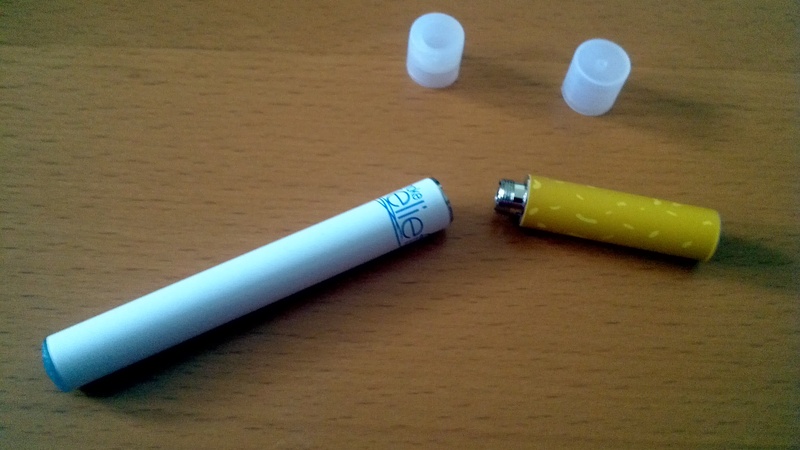 Each electronic cigarette consists of a battery and a cartomiser (atomiser and cartridge combined). As you draw on the cigarette the cartomiser gets powered up and vapourises some of the flavoured nicotine which you inhale as “smoke”. Cheaper than cigarettes – roughly equivalent to £1 a packet. 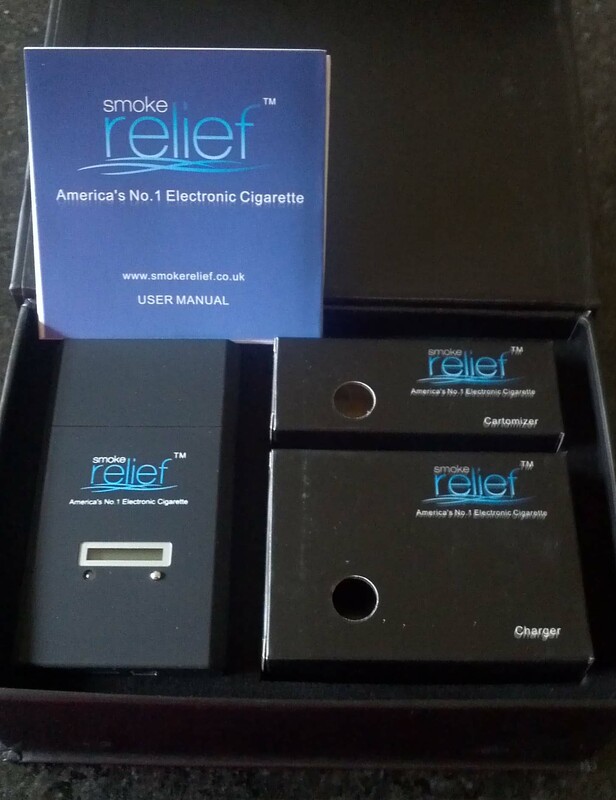 I was sent a Deluxe Rechargeable eCigarette Kit. It came in a lovely sealed box. First impressions are very important and this kit for sure leaves a good one. 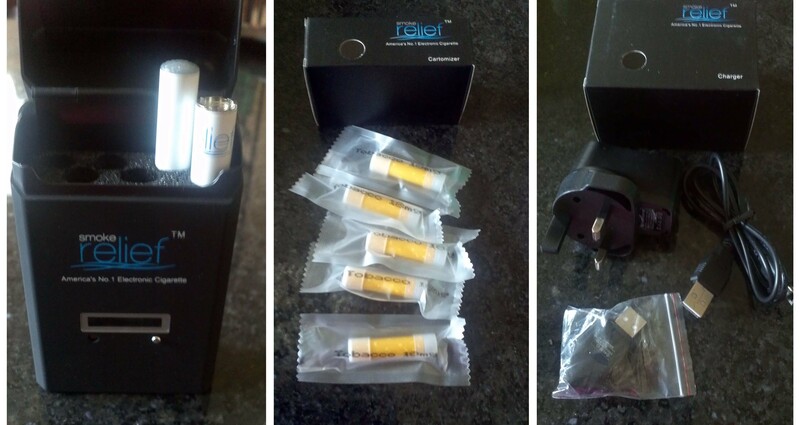 Deluxe Rechargeable eCigarette Kit would make a perfect gift for someone without any extra fancy packaging. It looks really nice and luxurious. So what do you get in your lovely box? At first I wasn’t so sure what to do… but I didn’t even open the box. For days I was walking around it, just looking at it and telling myself “Ok, today is the day!” Finally one day I built up the courage to open it up and give it a go… I am really glad I did so. Once you open it, the rest is really easy. You follow clear and easy instructions and within minutes you can be ready to go. I started with a tobacco flavoured cigarette. I found it a little bit heavy so I swapped it for the Apple flavoured one and it was a good call. They are really great! It is just like having an old style cigarette without the awful stink. While using it I did not find any downside. You still keep your hand busy, you still get your nicotine fix and you still can see smoke coming out of it… and most importantly you are reducing the health risks for you and everyone around you. I did however find a few areas where they could be made just a little bit better and more user friendly. Flavoured cartomisers have no markings on them. I did find it a little hard to pick the right flavour I wanted at the time. Your charging box has 4 slots for cartomisers, but as they all look the same, it is not so easy to remember which slot was taken by which flavour. And my second suggestion: if possible it would be nice to make them lighter. Mark smokes really tiny roll-ups and for him keeping it is quiet uncomfortable; it doesn’t feel right due to the heavy weight. 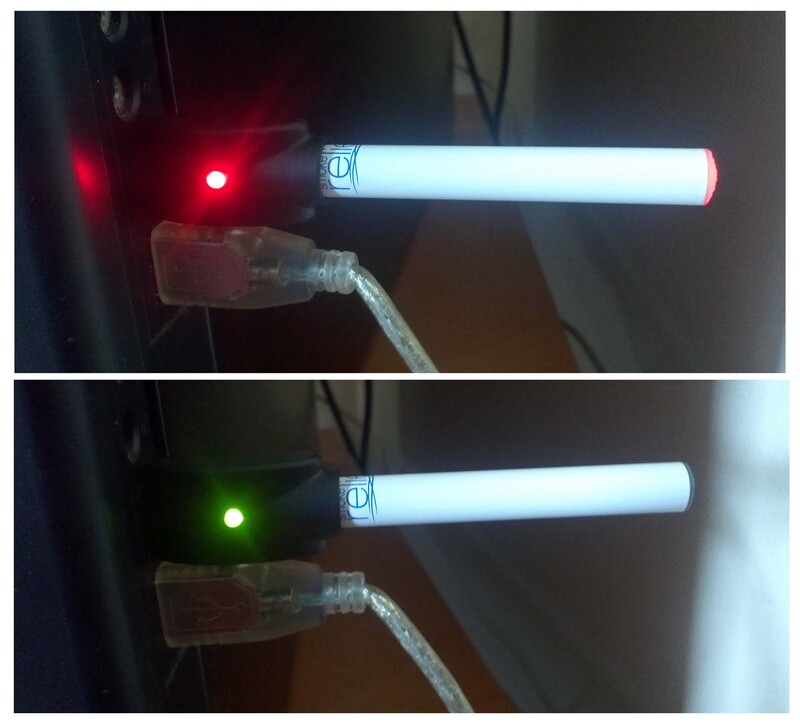 In general I would recommend Smoke Relief Electronic Cigarette to everyone who still smokes. It doesn’t have any real downsides. This change would be very positive for you, your health, your family and friends and of course much easier on your wallet… just think what you could buy using all the money you will save! Cartomizers are sold in packs of 5. Their price vary depending on the quantity you order (from £5.95 per 5 to as little as £4.75 per 5pack if you order 100+). One cartridge is good for 250-300 puffs and is equivalent to approximately one pack of 20 cigarettes. So 5 cartridges = 100 cigarettes. Smoke Relief cartridges are available in the following flavours: Tobacco, Menthol, Peach, Vanilla, Apple, Cherry, and Cappuccino flavours. There is also an option of mixed cartridges box (apple, cherry, cappucino, peach, vanilla) so you can sample the other flavours and pick your favourite. There is a one thing to remember! Electronic Cigarettes are NOT an aid to giving up smoking. 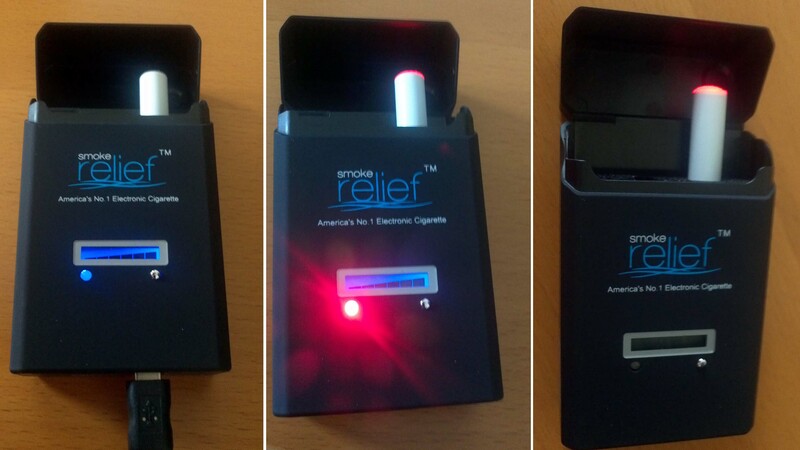 Smoke Relief electronic cigarettes are a harm-free alternative to old-style tobacco cigarettes for existing smokers. They are not a particularly good way to give up smoking because you are still addicted to the nicotine and you are still getting the full smoking experience. If you want to give up smoking you are best advised to just stop smoking or use a support group like Nicotine Anonymous or for more general advice www.smokefree.nhs.uk. Electronic Cigarettes are a great alternative to the messy and old age tobacco cigarettes. Whatever helps people quit or cut back on smoking, I’m all for it! Nicotine is addictive and very difficult to give up. I’ve never smoked by my husband struggled to quit for a long time and my mother-in-law uses e-cigs and likes them, from what I can tell. Good luck!! Yes, tell everybody you know to search on the web for e-cigarettes to see how large this business is, and how gigantic the selection is for these life saving products is. cigarette companies are investing in them. I can FEEL the benefits of electronic cigarettes. types trying to censure e cigarettes … the authorities should do a lot more to promote their use. This makes me cross. 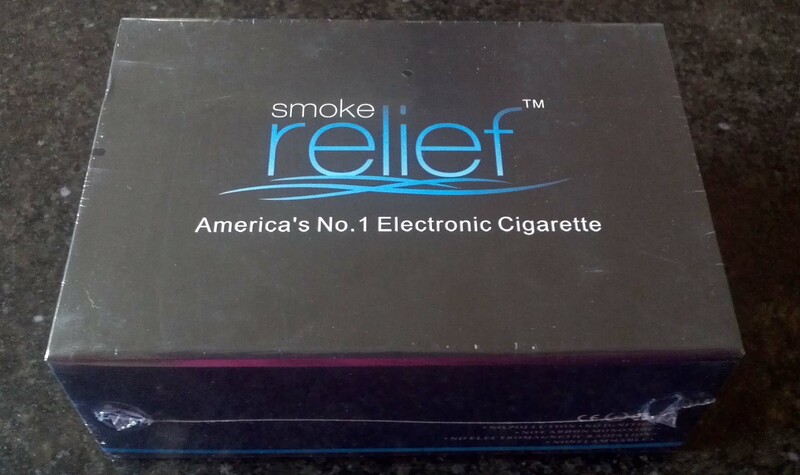 Thanks Review – Smoke Relief Electronic Cigarette | Bark Time = everything and nothing. to see how big this business is, and how large the range is for these fantastic products is. secret pact with these b*stards trying to prohibit e cigarettes . .. the EU people should do a lot more to support them. though, are the increasing number of stories in the major press saying how dreadful they are. suspect), as many are starting to think of making them. with big companies trying to ban e cigs – our country’s legislators should do a lot more to promoter their use. It makes me depressed. I really hope they don’t ban them. Not had a real ciggy for 4 months now thanks to using an e-cig. I am a supporter of these electronic cigarettes. I’m going to take a note of your website and keep checking for new information about once a week. I subscribed to your Feed too. I tried it, but that’s not really my thing. Since we only smoke outside of the house, we reduced smoking drastically. I hate it to be branded like an outlaw by a country who makes a lot of money with tobacco tax….